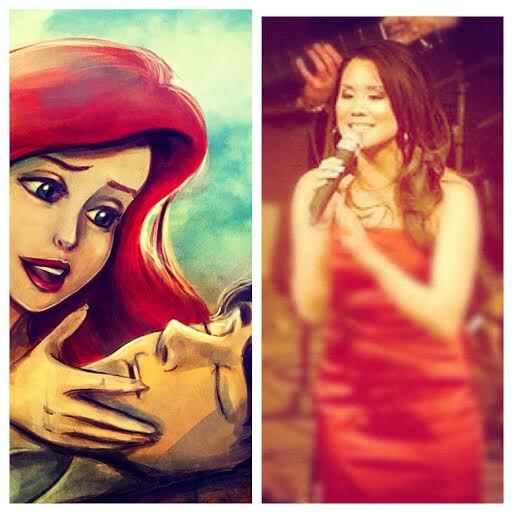 If You Were Ariel, Would You Give Up Your Ability To Sing Well For Love? I had to stop and think for a minute whether or not I would do so. Instinctively, I started listing the similarities I had with Princess Ariel. Like her, I am one of 7 children. She only has sisters; I almost have only sisters (insert chuckle here). My only begotten brother ruined that streak. Ariel is the youngest of 7, and although I am not (I am the second-to-the-youngest), I plan on claiming that role for myself anyway because my youngest sister is much more mature than I am. Ariel’s father, King Triton, is a strict ruler and to an extent, so is my Father. Of all her sisters, Ariel was the one most known for her singing abilities. With my siblings having all decided to make professional career choices, I am the child that my parents introduce to their friends last after having introduced my other siblings in a parentally proud way: “Maybelle is a lawyer, Julius is a Finance Director, Eunice is a Registered Nurse, Farah works in the Hotel-Tourism industry, Ruthie is a Gerokinesiologist, Rachel has made a career in the United States Military, and Guada….well, she sings.” And then, to prove to others that I’m any good, my parents will make me sing for their guests on the spot. The only differences Ariel and I have is the fact that at 32 years old, I am twice her age; I don’t have a pet crustacean, nor am I friends with a flounder or a seagull. And in case you’re wondering, I live on land…and though my Heavenly Father rules over The Ocean, my earthly father does not. But in any case, the short answer to the question is a resounding: YES. I would give up my ability to sing well for love. Long Answer: My first love is to sing. I have been singing since before I could talk, according to my Tiger Mother, and have performed in large venues, in front of large crowds, and have even been signed to an independent record label during my first few years living in California. I traveled with a group ensemble (a coveted spot I had to audition for and got), and was a lead singer in a band. What I quickly experienced was the loneliness after every gig, despite the countless people I met after every performance, and the individuals I worked day-in and day-out with. The solitude I feel during these times is the kind that makes the heart ache; there was a high from the lights and cheers that I wanted to keep attaining again and again. Despite that, singing and performing allowed me freedom—freedom to be another person on stage and the freedom to express my personality and joy in an unadulterated way that perhaps would be misunderstood on any other platform. But it didn’t take long for me to realize that the ability to sing and perform couldn’t keep me warm at night. It didn’t offer me companionship, nor did it offer me a way to bounce ideas off of someone. There is nothing like human interaction, especially interaction with someone you love. Life certainly was not created to be lived alone, but rather to be lived out in community with other people who can “do life” with you: share your joys, your sorrows, your pain, and your victories. I soon realized that singing was a source of so much of my joy as well as so much of my pain. Yes, singing is my first love—but, I noticed that this zeal of mine is sometimes misunderstood by others. Growing up, I had the unfortunate opportunity to learn that singing is a passion that sometimes others aren’t happy you have. At a young age, I couldn’t wrap my head around the fact that a gift I willingly shared with others could be rejected by some. When jealousies abounded by other girls who wanted the solos assigned to me, I had my first taste of that cut-throat world: a world full of envy, gossip, conflict, rivalry, and competition. It didn’t stop me from singing, though, and anytime I was ever asked to share my voice, I willingly did so, often times traveling far distances in an old, unreliable vehicle, and sometimes without pay. I did it out of the sheer love of singing and music. I could never give up my ability to sing even though a musician’s world is full of loneliness, pain, jealousy, bitterness and dissension. But for love? Yes. I would give it up a hundred times for love. Thank you, Prashu! I’m glad you enjoyed it!